Limited Edition of 500 Numbered Copies. The 1972 self-titled debut album by German group, Oratorium, is one of those rare albums that is shrouded in a certain mystique. This is a record that invites you into a sacred and supernatural world, one of uncompromising religious progressive rock. Led by composer Bernhard Hornig, the band was formed in 1967 under the name of Christian Unity with the focus solely on religious music. The early formation of the band consisted of three brothers and two class mates, all teenagers at the time. The Hornig brothers were the creative minds in the band. Bernhard acted as the composer, Georg took care of writing the lyrics and their youngest brother Rainer, who had had vocal training as a member of a famous German youth choir, took over the lead vocals. Bernhard soon began composing songs for a religious rock mass, the first of it's kind. In December 1968, long before the musical Jesus Christ Superstar, the "first German Beat-Mass" debuted which was almost banned by the local bishop. Luckily, all went well, and Christian Unity received official blessings to continue to play. When Bernhard finished writing the 2nd German beat mass in June 1969 they became Oratorium. They performed at local schools, diverse ecumenical events, as well as for the US armed forces. In 1971, the leader of the influential Christian youth organization, KIM, padre Lienhard, contacted the group and organized a tour of 15 concerts which ultimately led to the idea to record a vinyl LP. 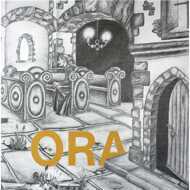 The recording of "Oratorium" took place 3 days during March of 1972 at the St. Konradskirche in Hof. The mass itself was a glorious success and the album itself was as daring as it could get for a religious release! Unlike other Christian and religious albums of the time which always tended towards pop or amateurish rock, Oratorium was different, there was a serious, professional and progressive approach in their music. Songs were well arranged with rhythmic changes and thrilling organ performances. Rainer Hornig floated above the orchestrations with a charismatic voice. Outstanding songs of the album are the opening title "Ich Bin Nicht Mehr Allein", which was originally part of the first mass, as well as the epic "It's Love", a composition from the second mass. Of course, as goes many of the stories told here, with almost zero promotion and no distribution channels the album didn't do anything. The handful of copies which are known to exist these days as well as the great music placed this album among the top rarities for Krautrock collectors worldwide. It is understandable that we are deeply honored to offer you this highly collectable self-titled album by the vanguard of German Xian rock. A veritable holy grail: Oratorium.